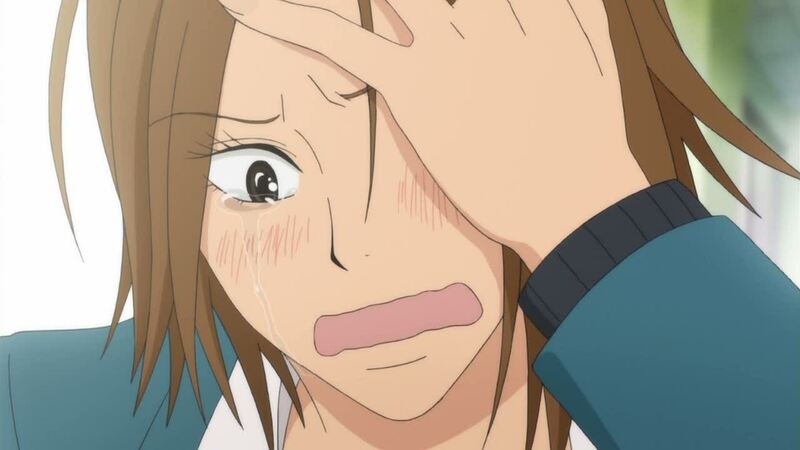 Kimi ni Todoke 20 review; Chizu coming to terms with her disappointment. Well, this episode picks up with Sawako wondering if Chizu was able to give Ryuu his birthday gift. Later that night Chizu is laying in bed thinking about that very same thing when she grabs the gift and decides to head over to Ryuu’s to give him his gift. By the time Chizu arrives at Ryuu’s, Tooru has already left, and Ryuu and Chizu share some unkind words and Ryuu ends up telling Chizu to give up on his brother, and Chizu throws Ryuu’s gift at him. Later, at school, Sawako and Ayane both commiserate over their uselessness and their inability to be much of a help to Chizu in the current situation. 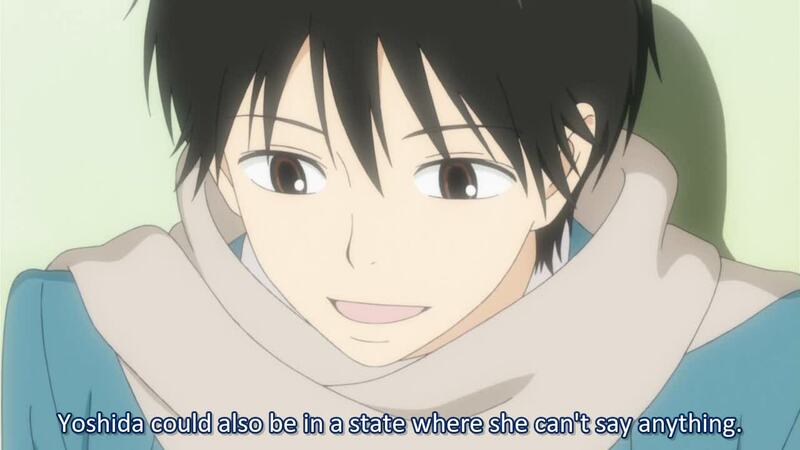 Soon, Kazehaya joins Sawako and Ayane in a stairwell conversation over the whole Chizu/Ryuu/Tooru thing, and he sort of reassures them that Chizu should be alright since she has two friends that worry and care for her. When Chizu arrives in class, there’s a tension between her and Ryuu. Also, there’s a tension between Ayane, Sawako, and Chizu, but Ayane leaves Sawako a note saying to treat Chizu normally, and if she needs support they’ll be there if she needs to cry her eyes out. When lunch period begins, Kazehaya takes off with some of the boys leaving Ryuu and the three girls in the classroom. When Chizu takes off to buy some lunch Ryuu gets up and leaves a few seconds later leaving Ayane and Sawako to wonder if he went after Chizu. When Ryuu confronts Chizu in the stairwell he has to grab her arm to keep her from walking off. 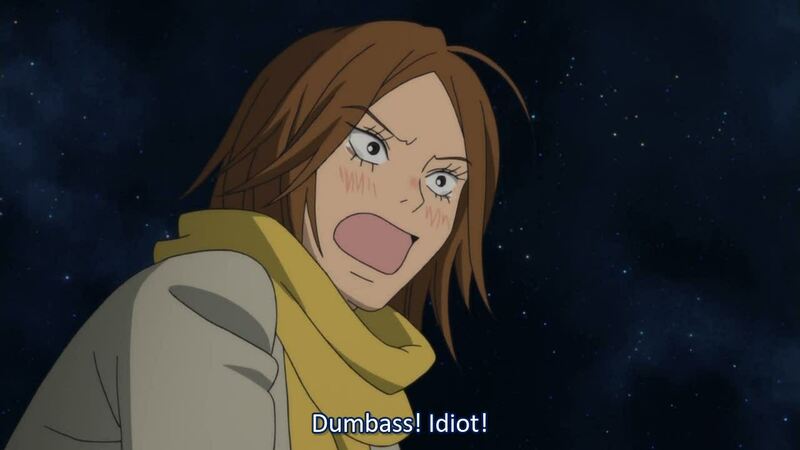 Chizu starts shouting at Ryuu drawing the attention of the other students including Sawako and Ayane. Chizu asks if Ryuu thought she needed to be rejected, yeah. 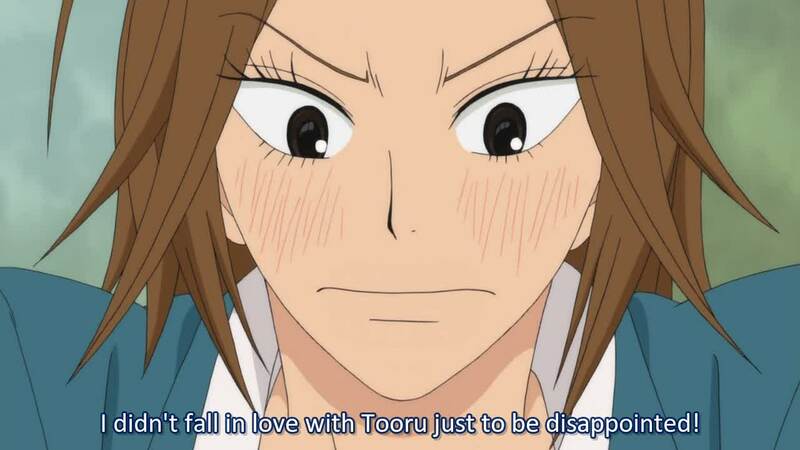 Chizu tells Ryuu that she didn’t fall in love with Tooru to be disappointed and she runs off. 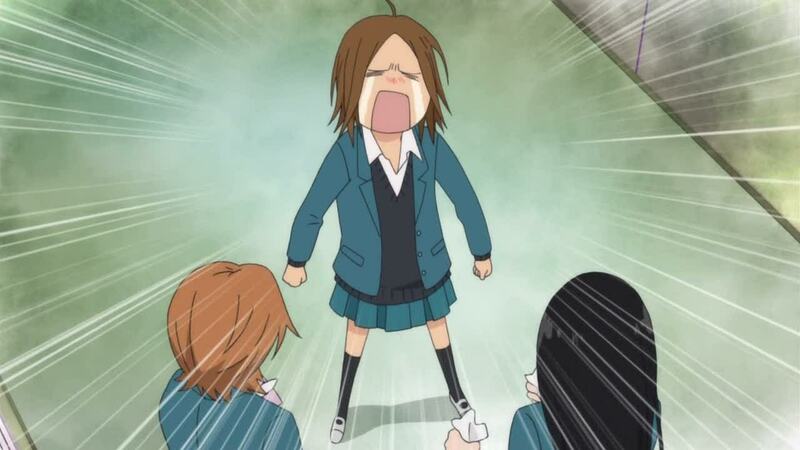 Sawako and Ayane catch up with Chizu and Sawako starts balling and this leads to Chizu cutting loose. Chizu cuts loose with everything that happened, she lets it all out, and Ayane and Sawako are just kind of there for her. Chizu tells them of her anger at Ryuu, her frustration over Tooru, and that she’s most disappointed about how she threw Ryuu’s birthday gift in his face. Chizu ends up crying while Ayane and Sawako hold her, and on their way home Chizu says she feels a lot better and is ready to eat some cake. 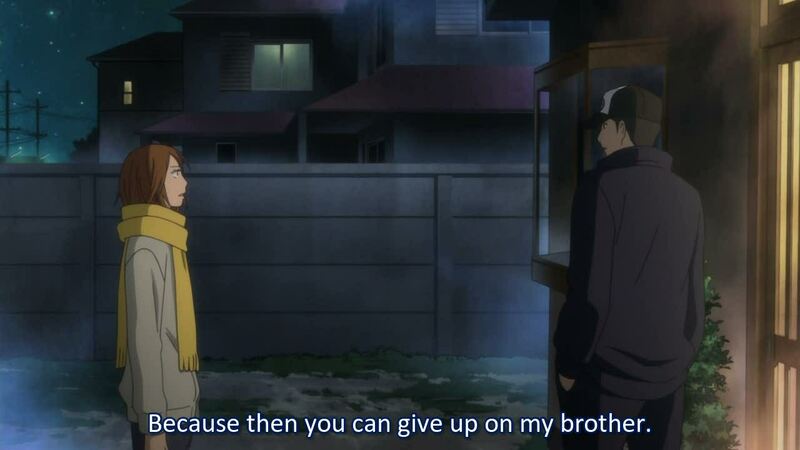 The episode ends with Ryuu placing a telephone call to his brother about Chizu. Well, in this episode Sawako seems to have learned another important lesson about friendship, that being, if you can’t directly help your friend, just be there for them. Since the end of the last episode, and through most of this episode, Sawako has been agonizing about her inability to be any real help to Chizu even though Ayane tries to tell her there’s not much you can do. 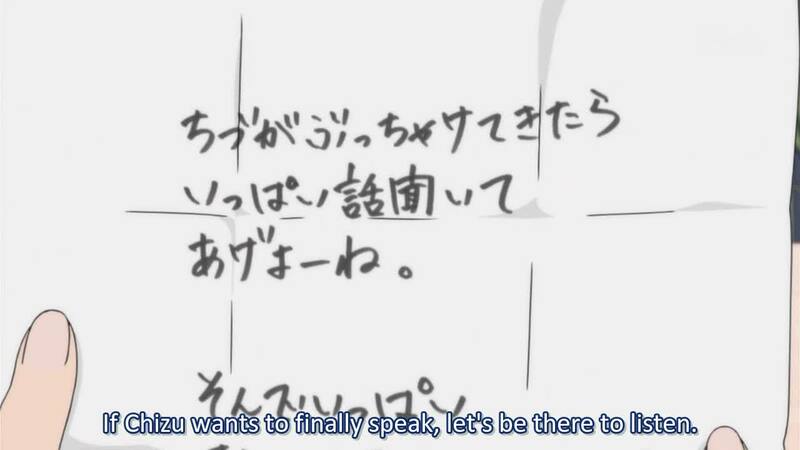 Also, Kazehaya shows a remarkable amount of wisdom in this episode, and his words seem to really help Ayane and Sawako. But, it was also quite funny when he tells Sawako and Ayane that he would most likely be useless if he was in the same situation, sometimes there are no right words to help ease the pain. In the end I guess it all worked out of the best with Sawako’s tears causing Chizu to let loose all her sadness and frustrations in the hallway. I think that Chizu letting loose of her emotions was very healthy and is the first step in her journey of coming to terms with her feelings and herself. Well, I’m looking forward to the next episode to see if Ryuu is going to manage to set something up between his older brother and Chizu that’ll help ease Chizu past this rough spot and lead to some emotional closure for her.